I think I may need to check what I'm wearing before I walk out the door. 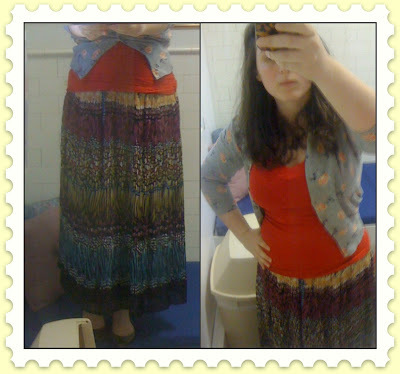 I'm mixing patterns, I'm wearing maxi skirts. My mother looked at me and started speaking and then stopped when I saw her this morning. That's never a good sign. Either way, it's an outfit with some interesting pieces. I got the skirt for $15 at Macy's- it's Alfred Dunner, a name you probably recognize from your grandmother's closet. Remember I made a sassy face wearing it here? It is pleated chiffon, with an elastic waist, I choose comfort sometimes, so sue me. Additionally, doesn't it look like a Tiffany lamp? Gorgeous! The shirt is Forever21, my favorite T from them they keep not carrying. And the cardigan is Forever21, I love fun printed cardigans- they make jeans and a t-shirt look put together. The shoes are my favored flats- the only ones I wear, the ones I've had resoled and seem to be on their last legs. I don't want to discuss it, it's too sad. Anyway, it's a hodgepodge of an outfit- but it's cozy and creative. Look below to grab the look or just pick a piece!